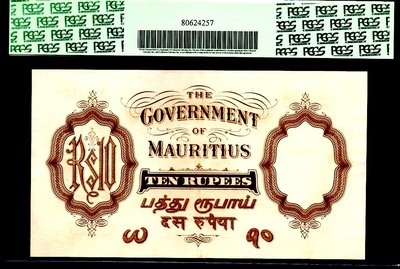 MAURITIUS P20 1930 5 RUPEES "KING GEORGE Vth!" CGC 45PQ LOOKS ALMOST UNC!!! "ONLY 2 EVER GRADED BY ALL GRADING CO'S!" EXTREMELY RARE ISSUE & TYPE! WE'VE NEVER SEEN ONE BEFORE OFFERED ANYWHERE!!!! THIS NOTE HAS EXTREMELY NICE CENTERING / MARGINS, SHARP CORNERS AND NICE DEEP RICH BLUE COLORS! MAURITIUS IS AN ISLAND (MEMBER OF BRITISH COMMONWEALTH) LOCATED 500 MILES EAST OF MADAGASCAR. ALTHOUGH KNOWN TO ARAB AND MALAY SAILORS AS EARLY AS THE 10TH CENTURY IT WAS FIRST EXPLORED BY PORTUGUESE IN THE 16TH CENTURY AND SUBSEQUENTLY SETTLED BY THE DUTCH, WHICH IS WHO NAMED IN HONOR OF PRINCE MAURITIUS VAN NASSAU IN THE 17TH CENTURY. SUGAR CANE BASED ECONOMY WAS CAPTURED BY THE BRITISH IN 1810 DURING THE NAPOLEONIC WARS! A VERY HISTORICAL AND RARE PIECE AND TO FIND IT IN THIS CONDITION IS PROBABLY ONLY GOING TO BE OFFERED IN THE OPEN MARKET ONCE IN A LIFETIME! 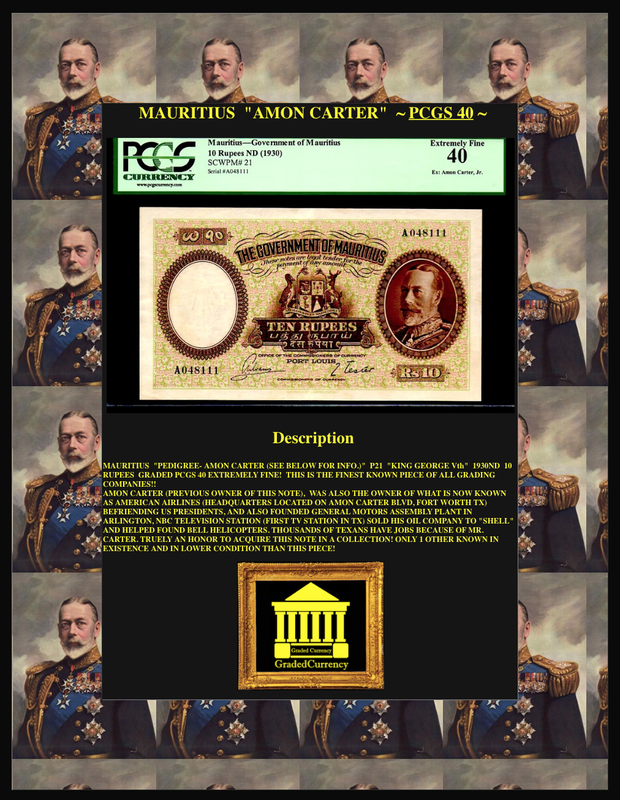 MAURITIUS "PEDIGREE- AMON CARTER (SEE BELOW FOR INFO.)" P21 "KING GEORGE Vth" 1930ND 10 RUPEES GRADED PCGS 40 EXTREMELY FINE! THIS IS THE FINEST KNOWN PIECE OF ALL GRADING COMPANIES!! AMON CARTER (PREVIOUS OWNER OF THIS NOTE), WAS ALSO THE OWNER OF WHAT IS NOW KNOWN AS AMERICAN AIRLINES (HEADQUARTERS LOCATED ON AMON CARTER BLVD, FORT WORTH TX) BEFRIENDING US PRESIDENTS, AND ALSO FOUNDED GENERAL MOTORS ASSEMBLY PLANT IN ARLINGTON, NBC TELEVISION STATION (FIRST TV STATION IN TX) SOLD HIS OIL COMPANY TO "SHELL" AND HELPED FOUND BELL HELICOPTERS. THOUSANDS OF TEXANS HAVE JOBS BECAUSE OF MR. CARTER. TRUELY AN HONOR TO ACQUIRE THIS NOTE IN A COLLECTION! ONLY 1 OTHER KNOWN IN EXISTENCE AND IN LOWER CONDITION THAN THIS PIECE! MAURITIUS P27 "QUEEN ELIZABETH II" 1954ND 5 RUPEES GRADED CGC 66 SUPERB GEM! FINEST KNOWN BY CGC! THIS NOTE HAS EXTREMELY NICE CENTERING / MARGINS, SHARP CORNERS AND NICE DEEP RICH BLUE COLORS! MAURITIUS IS AN ISLAND (MEMBER OF BRITISH COMMONWEALTH) LOCATED 500 MILES EAST OF MADAGASCAR. ALTHOUGH KNOWN TO ARAB AND MALAY SAILORS AS EARLY AS THE 10TH CENTURY IT WAS FIRST EXPLORED BY PORTUGUESE IN THE 16TH CENTURY AND SUBSEQUENTLY SETTLED BY THE DUTCH, WHICH IS WHO NAMED IN HONOR OF PRINCE MAURITIUS VAN NASSAU IN THE 17TH CENTURY. SUGAR CANE BASED ECONOMY WAS CAPTURED BY THE BRITISH IN 1810 DURING THE NAPOLEONIC WARS! A VERY HISTORICAL AND RARE PIECE AND TO FIND IT IN THIS CONDITION IS PROBABLY ONLY GOING TO BE OFFERED IN THE OPEN MARKET ONCE IN A LIFETIME! 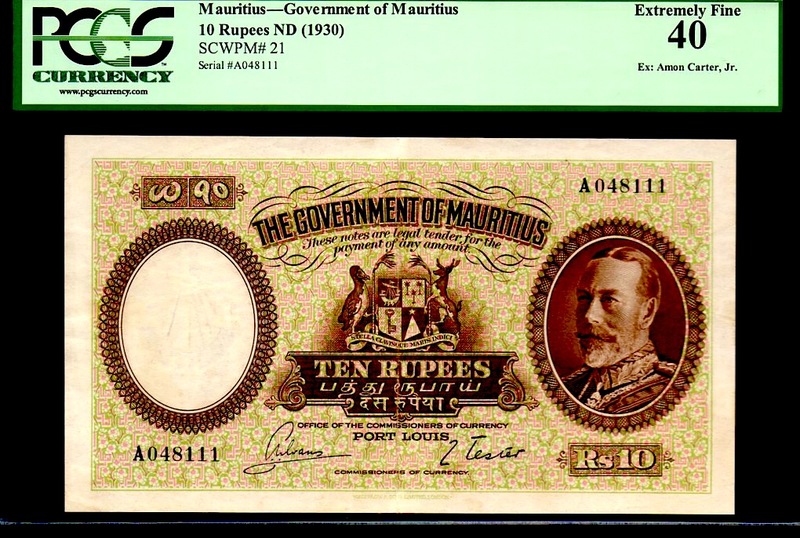 MAURITIUS P28 1954 QUEEN ELIZABETH II ONLY TWO EVER GRADED (INCL. THIS PIECE) BY ALL GRADING CO'S!!! GRADED BOTH PMG & CGC 67PQ! POP 2! * New piece added to census coming out. 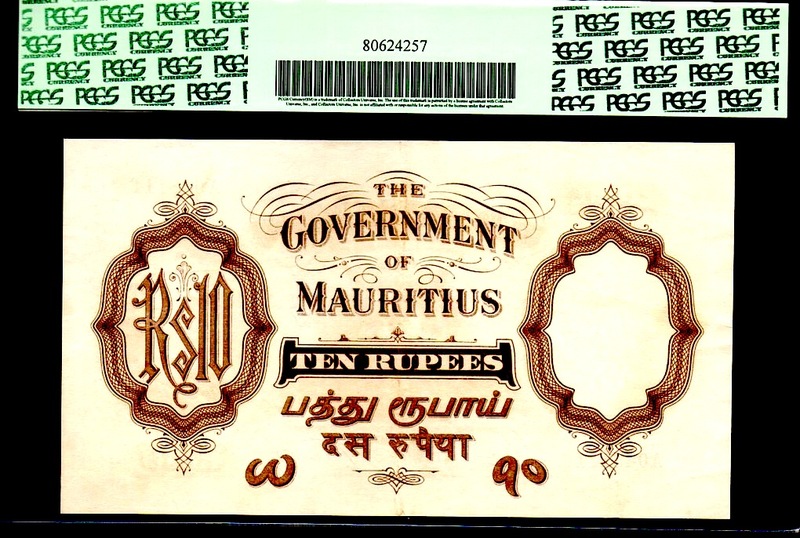 MAURITIUS P28 1954 QUEEN ELIZABETH II ONLY TWO EVER GRADED (INCL. THIS PIECE) BY ALL GRADING CO'S!!! GRADED BY BOTH PMG & CGC 58PQ! POP 2! * New piece added to census coming out.